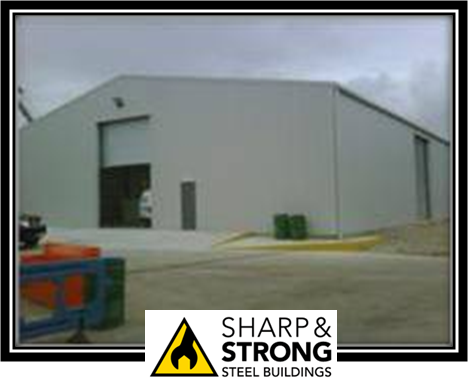 In the past year we have supplied and erected over 30 large steel framed buildings in various locations in the UK. Here are a few of our case studies for you to browse through. 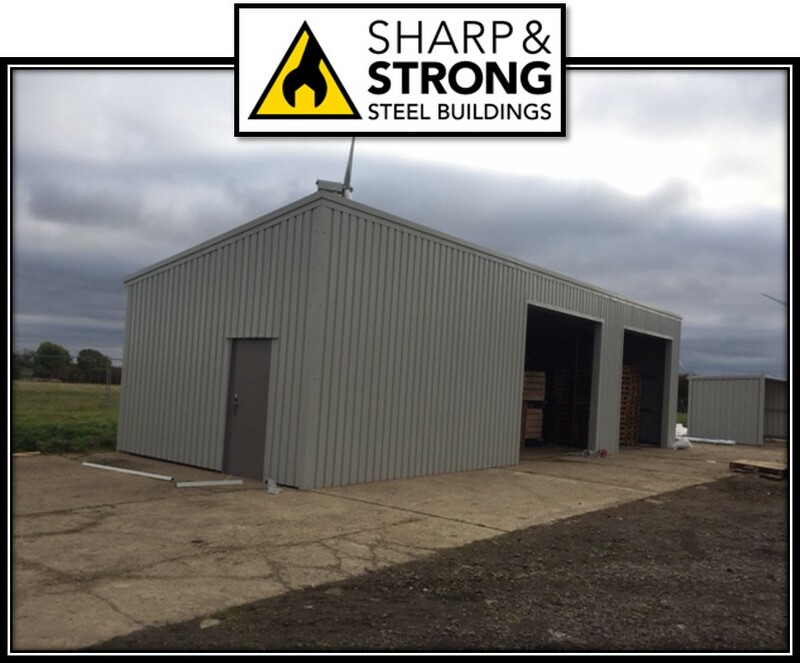 This steel framed building warehouse of pre-fabricated steel was erected for a company based in Doncaster to be used as a warehouse and measures 12 meters wide x 24 meters long with a 5 meter height to the eaves. 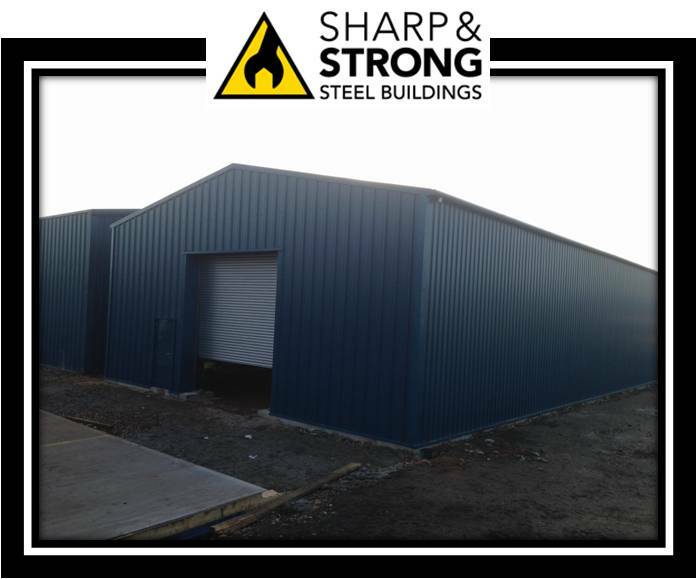 The steel warehouse was designed with a single skin, Ocean Blue cladding , with 1 roller shutter door in the gable end and a couple of personal access doors. 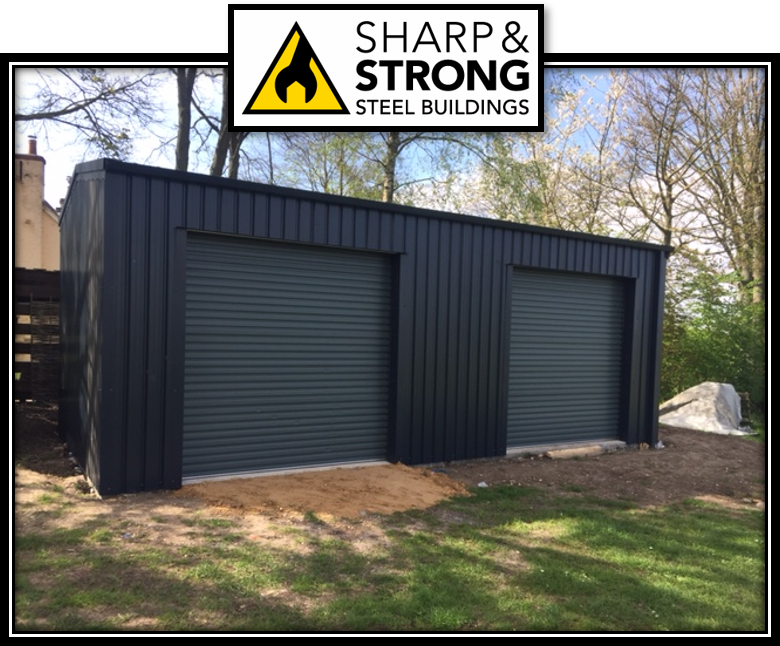 This cold rolled steel building warehouse was fabricated to match our clients building they had on site already, so it was essential the we got the colour of the cladding to match perfectly. 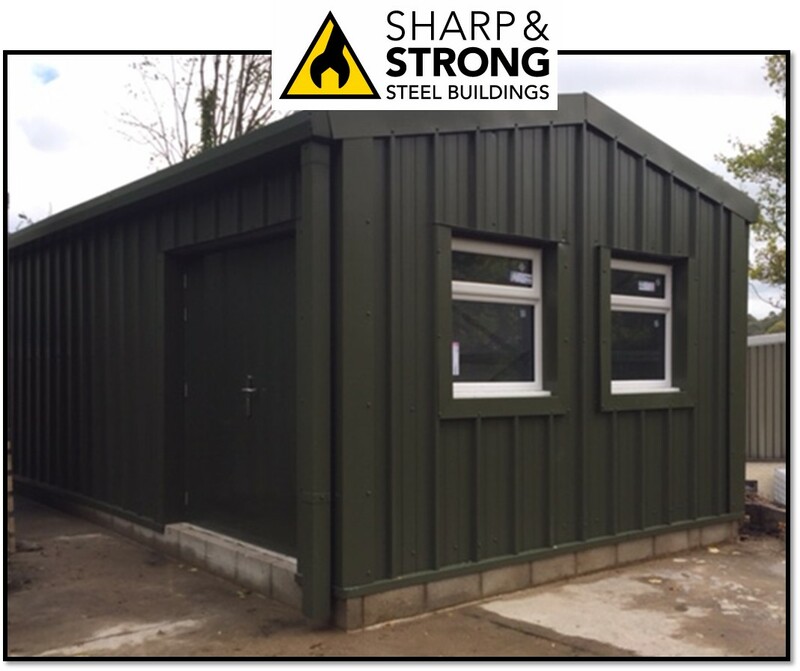 All our steel framed buildings are available in different colours. Have a look at our colour chart. This building was erected during the Winter and due to the bad weather it was decided to erect the steel framed building first once the footings had been done and then lay the concrete base. This was the first time that we had done things this way around and it worked very well! Fire boundary conditions were stipulated on two elevations of this building. This means that the steel should be fire protected and the cladding should have an insulation and integrity function. Where structural fire resistance is required in a boundary condition, it has been widely accepted that it is necessary only for the affected wall and its supporting stanchions to have a fire resistant function, so the front gable and the left side elevation had to have fire base cleats and the cladding had to be 40mm thick. Jonathan Bradley of Sharp and Strong Ltd with the celebration cake! 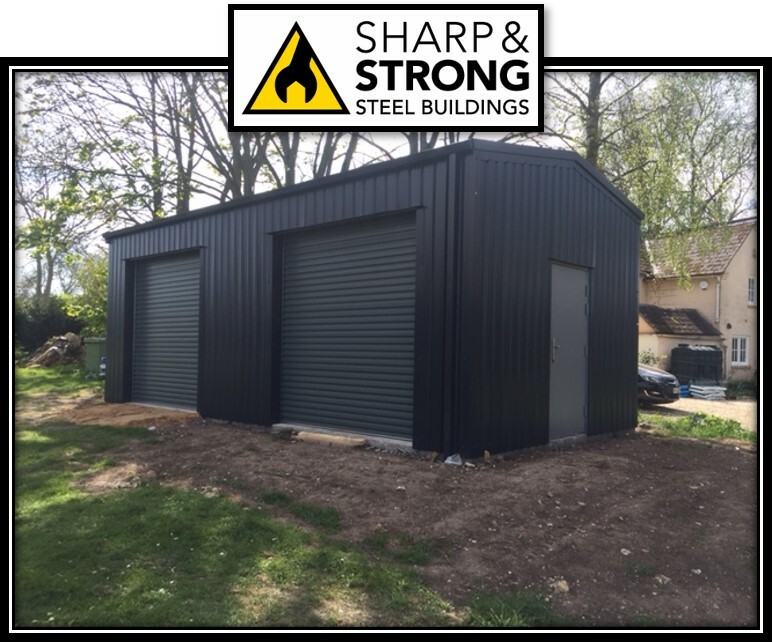 We were invited to quote for a Client in Swanage, Dorset to provide several steel buildings for their industrial estate to be done in stages. The first phase of the build was to erect Unit 4 which is 13 meters wide by 17.5 meters long and 4.5 meters to the eaves with a 2.4 meters brick wall around it with insulated walls and roof in Goosewing Grey cladding to include windows, roller shutters and doors. The building had a mono pitch roof so instead of the usual pitched roof this building had a 6 Degree slope from front to back. The second building units 5, 6 & 7 was well under way of being completed and this building was 11 meters wide by 37.5 meters long and 5.4 meters to the eaves, again with insulated walls and roof and a brick wall at 2.4 meters. 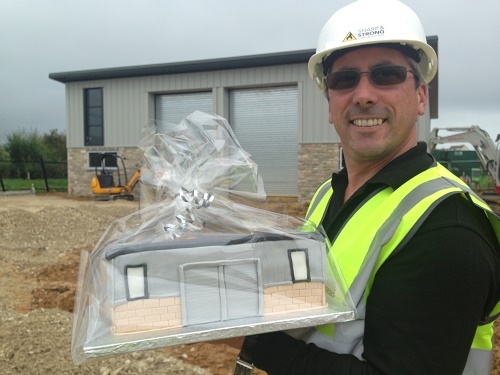 Once the steel building had been completed we decided to commission a cake by Creative Cakes by Kaz. to look similar to Unit 4 which we presented to our client on the day of the completion of the steel buildings. 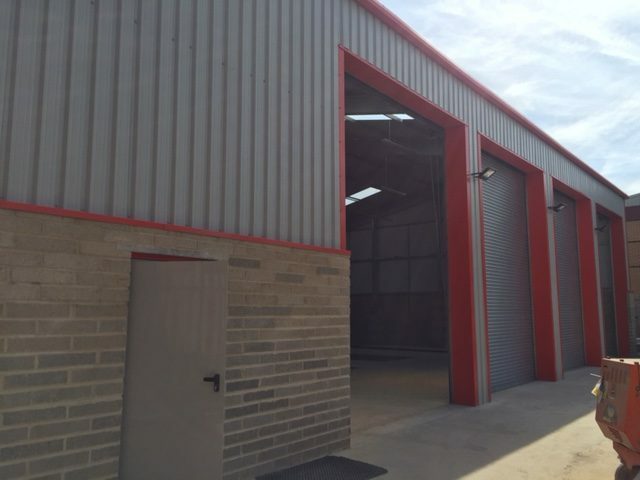 We are now in the process of quoting the client for another set of buildings to finish off the industrial estate and these are due to erected in May this year. Steel Framed Building for Northants Fire and Rescue Service has just been completed. 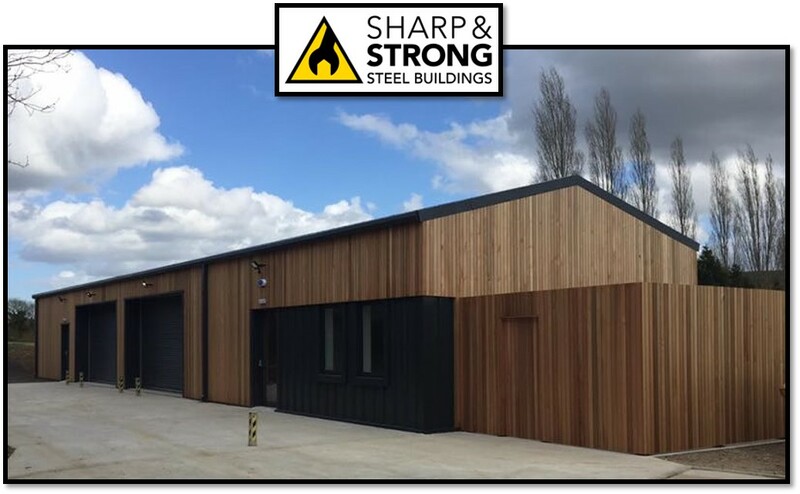 The client came to Sharp and Strong requesting a steel framed building to be used as part of their training program. 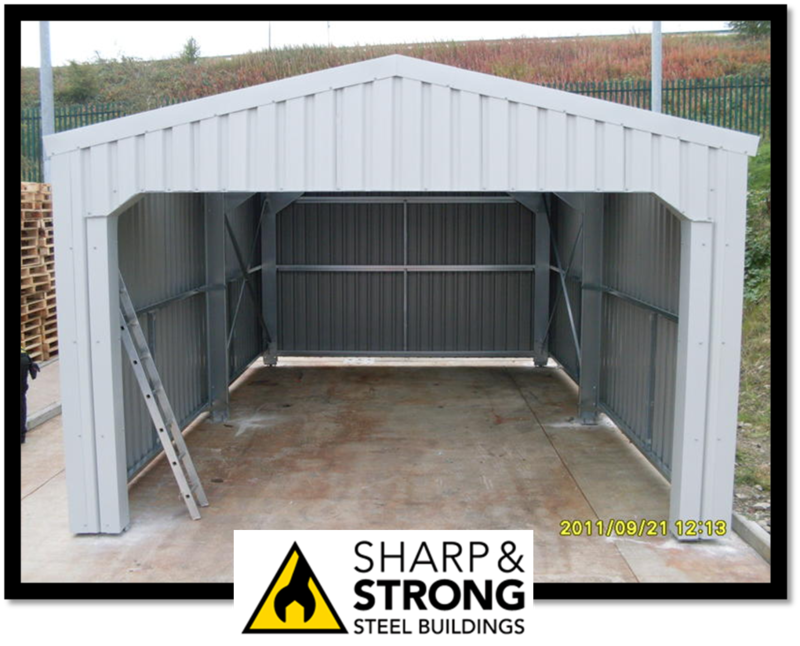 This steel framed building is 5 metres wide x 15 metres long. Instead of a standard pitched roof the client wanted a mono sloped roof with a 10 degree pitch. The front of the building is 4 metres high and the back is 3.118 metres high. With Mono sloped roofs there is usually a slight slope from the front to the back of the steel building with a 6 or 10 degree pitch to allow water to run off them. These roofs are generally used on industrial or commercial buildings. This roof design is conducive for installing PV solar panels for a more energy efficient and energy independent building. Flat roofs are easier to construct than pitched roofs and require fewer building materials, thus keeping costs down. 4. HGV MOT Testing Steel Building in Swindon. 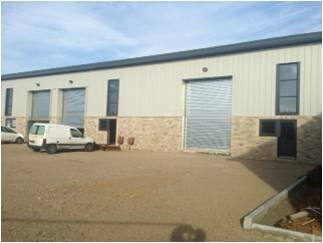 Full turnkey HGV steel building project has just been completed in Swindon. 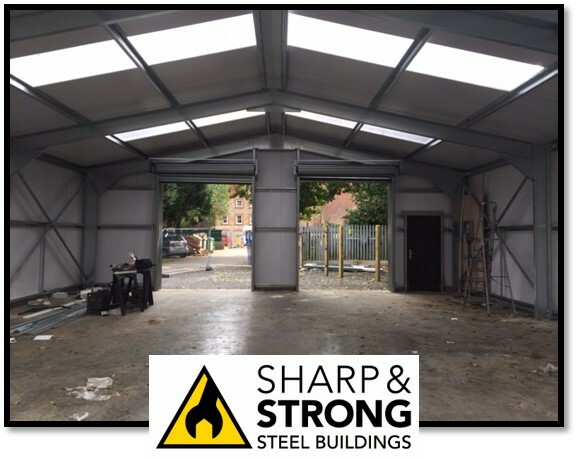 The project based around excellence in the design and installation of steel framed buildings – in this case designed specifically for the clients requirements as an HGV MOT workshop. 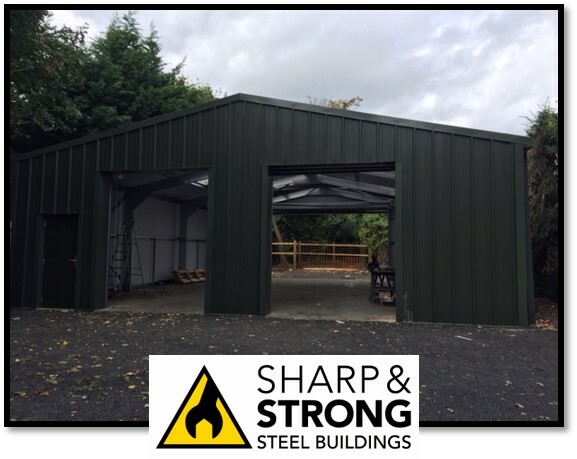 The full turnkey HGV steel building project was undertaken by Sharp and Strong from structural calculation drawings, planning and building control, groundworks, blockwork, building supply and construction, sophisticated electrics and plumbing. 15 metres wide x 23 metres long x 6 metres high to the eaves with a 12 degree pitch. 2 x gable end walls having fire boundary condition’s of 60mm composite cladding in Goosewing grey with Red trims. As part of the full turnkey steel building process the Internal blockwork walls were also erected for the clients office and toilet facilities including all white goods and plumbing. Take a look at this timelapse video to see how the building was erected Click here. We have just completed a large full turnkey project for our Client at Feldon Valley Golf Club in Oxfordshire. We were asked to tender for this large project, which was to provide the Greenkeepers a welfare facility. 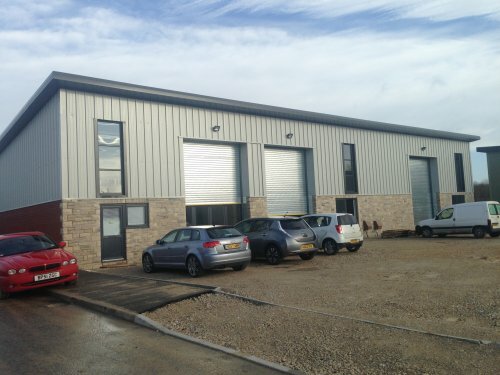 The full turn key project we undertook included groundworks, erecting the steel building, wood cladding the outside of the steel building, full internal fit out, electrics, plumbing, fowl and sewage works and landscaping. The project was started in January 2017 with the removal of trees, bushes and shrubbery to make way for the grondworks team to come onto site to put in the foundations for the steel building. By February the steel frame building was being erected by our team of erectors. The building is 7.4 metres wide x 28 metres long and 3.4 metres to the eaves and over clad with Red Cedar Wood. Included are 2 x roller shutter doors, 4 x personal access doors and aluminum windows. The internal fit out included a kitchen/dinning area, laundry area, shower room, toilet and disabled toilet. Due to new legislation on staff welfare it is advised that all Golf Course owners have to ensure adequate provision for staff on site and there is more information on the blog here.